I’ve started writing a Top Five every year. I only include films that have been released in 2011 (incidentally, the best film I have actually seen this year was 2004’s Before Sunset) and there are some big films that I haven’t seen so I cannot give an opinion on Melancholia, Tree of Life, Arrietty, Submarine and several others. Equally, there are lots of great films that didn’t make the cut, namely Black Swan, Kill List, Tintin,Harry Potter VIII and my controversial triple-bill of guilty pleasures: Scream 4, Fright Night and Thor. Duncan Jones followed his smash debut Moon with another superb sci-fi flick. Source Code is essentially Groundhog’s Day on a train, whereby a marine (Jake Gyllenhaal) must keep re-living the final twelve minutes of a train bomb victim’s life until he discovers the bomber’s identity. A brilliant example of proper sci-fi and not just an excuse for an action film (see Rise of the Planet of the Apes, I Robot, etc), this is clever stuff and riddled with clues to reward repeat viewing. Meanwhile, it remains accessible sci-fi, never failing to hit the right emotional and entertaining notes to ensure mainstream popularity. It is easy to forget Oscar season when reviewing 2011 but Tom Hooper’s award-storming masterpiece should not be overlooked. Amidst the hype lies a very good film, in equal parts well-directed, well-acted, well-scripted and well-designed. Colin Firth gives the performance of his career (and possibly the year) whilst Geoffrey Rush is on scene-stealing top form. And who would have thought a 1930s-era British film about speech therapy would be such a feel-good, laugh-out-loud success. This is the regal Good Will Hunting. A modern-day Taxi Driver, Drive was the coolest film of the year. Director Nicolas Winding Refn was guilty of style-over-story with his 2008 Bronson but here he strikes the perfect balance of both. As such, we have beautifully-directed shots, well-crafted slow-motion and hyper-violence combined with an unpredictable plot and intriguing character arcs as Ryan Gosling’s getaway driver takes on gangsters. It is also boasts the best soundtrack of the year. Woody Allen is still going strong at 75 and this year he returned with Midnight in Paris. It contains all the staples of a Woody Allen classic – romance, quick wit, lengthy focus on forming and deteriorating relationships – but it also introduces a new twist: fantasy. Owen Wilson’s Gil travels back in time to 1920s Paris at midnight each night and meets Hemingway, Dali, Picasso and the Fitzgeralds. Allen’s writing is as sharp as ever and he has a lot of fun playing with our expectations of these characters, Extras-style. It is charming, sweet, whimsical and thought-provoking with no small amount of magic. In short, it is a Woody Allen film. In many ways, Hugo is the true Pixar film of 2011. Hugo shares all the trademarks of a Pixar classic: it looks beautiful, the 3-D is well-utilised (the best since Avatar), it doesn’t shy away from adult characters or content and for every laugh there is a tear. Most surprisingly, the director at the helm is none other than Martin Scorsese, who has put aside violent adult masterpieces for a child-friendly triumph. Scorsese’s influence is most evident in the lengthy tribute to silent cinema which occupies much of the film, specifically the work of Georges Méliès. Scorsese has used cutting-edge technology to educate a whole new generation of children about silent movies – a winning combination. 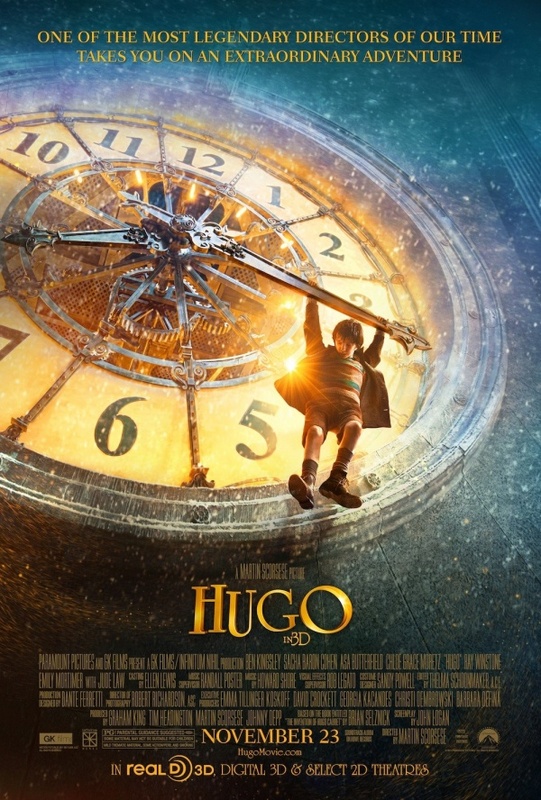 Hugo is more than a great film – Hugo isabout film. Add to that accomplished child actors, a triumphant Howard Shore score and an unrivalled supporting cast and you have the most enchanting film of 2011. And tragically, more people went to see The Smurfs.